Exterior wall insulation is an insulated coat or layer installed on the exterior of a property, followed by one of many decorative finishes. EWI otherwise known as external wall insulation, insulated render or solid wall insulation is the ideal thermal barrier for solid wall houses and older buildings in general. Specifically suited to single skin walls, solid walls, prefab houses and timber frame buildings, External wall insulation is the ideal solution for these types of buildings and other properties that are unable to take advantage of cavity wall insulation. 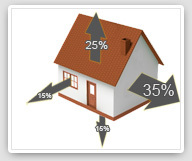 FACT: External walls are the most costly source of heat loss for a residential property! ... Due to this little known fact, property owners are still initially opting for the more obvious efficiency drives such as window replacement... until now! We are now seeing a swing in favour towards wall insulation, specifically external wall insulation for solid walls, which is now making a conciderable difference in the efficiency of homes throughout the UK. Here in this section you will find information and benefits regarding all aspects of external solid wall insualtion, including some frequently asked questions we are asked on a regular basis. With huge benefits such as reduced heating bills, lower carbon footprint, damp and condensation eradication and 0% VAT on the full project (paid by Avant Coatings Ltd) exterior wall insulation is quickly taking forefront in the solid wall home improvements market. What will external wall insulation do for me? An external wall insulation system, installed by Avant Coatings Ltd, on a solid wall, three bedroom semi detached house, can slash your heating bills by around £400 per year, reducing your carbon footprint by up to 2.1 tonnes! As the process of installing exterior wall insulation can be tailor made, the insulation system can be designed to satisfy even the most extreme U Value requirements. Our standard installation adheres to government guidelines and building regulations, but far higher thermal U values can be achieved with EWI. Avant Coatings Ltd is even capable of turning your property into a ‘super insulated’ structure, far outperforming any other type of wall insulation! External wall insulation has the added benefit of acting as an acoustic barrier, greatly reducing external noise from road and air traffic. As fuel prices rise... now your fuel consumption falls: As fuel bills are on the rise, reducing fuel consumption has never been a higher priority. On an un-insulated solid wall house, 45% of heat is lost through external walls, higher by far than any other external exposure (roof, windows ...etc). With the installation of external thermal insulation, fuel consumption used to keep your property warm is slashed meaning no more nasty surprises landing on the door mat! In the same way EWI will keep your property warm in the winter, it will keep your property cool in the summer avoiding the costs of running fans and expensive air conditioning systems. VAT FREE Installation: Avant Coatings Ltd is currently offering to pay the VAT on all installations that include an insulating element. This means, reduced costs of installation for you, whether it is a full exterior wall insulation system or a limited area insulated as part of a larger project, Avant Coatings Ltd will pay the VAT on the full project! Why? We aim to become carbon neutral. This means we intend to install enough solid wall insulation to counter the carbon we use in our daily operations. Lower Carbon Footprint: As we all contribute to carbon emissions through every day living, some consumers and companies (Avant Coatings included) understand the importance of reducing these emissions where possible and to become more eco friendly. By thermally insulating the walls of your home with EWI you could save as much as 2.1 tonnes of carbon per household, per year. Our mission year on year is to become a carbon neutral company. We aim to install enough solid wall insulation (which in turn will save household carbon emissions) to negate the carbon we produce with our machinery and vehicles. To help us hit our target, Avant Coatings Ltd is currently offering to pay the VAT on all installations that have an exterior thermal insulation element, a great benefit to our customers and a significant benefit to the environment. EWI - The Most Effective Wall Insulation EWI can be installed using a variety of insulation materials. These materials range from phenolic insulation, expanded Polystyrene (EPS) insulation, extruded polystyrene (XPS) insulation, PUR / PIR rigid insulation, woodwool insulation, natural mineral wool insulation and Cork insulation. Each of these insulation materials have a different thermal value (U values) and can be applied at different thicknesses, usually anywhere between 20mm to 120mm. This means an EWIS can be specified which will far outperform other wall insulation methods such as cavity wall insulation. Tailor Made Solution The design and installation of an EWI system is often quite different for each property. Differences in specifications range from variations in desired U values, through to the final decorative finish of the exterior wall. This means the whole process is very flexible, so we are able to design the perfect solution each and every time, delivering exactly what our customers need. During the site survey details and measurements will be taken of the existing structure. Detailed calculations will be made to determine the thickness of insulation required and condensation risk analysis reports will be produced. Dry walls for healthy living: The Problem There are many reasons why damp can occur in a house or commercial property. Damp can encourage mould to grow, which can cause health problems for residents. There are generally two sources of moisture which reside on internal walls causing damp. The first is water leaking in from a compromised external wall, e.g. cracks in render or a poor state of repair regarding external walls such as loose or broken pointing, damaged, porous or spalled brick or stone. This water finds its way through the external wall, appearing as damp, occasionally mouldy patches on the internal wall. The second source of moisture comes from within the property in the form of condensation, again appearing on the internal surface of an external wall, often accompanied by mould, especially behind furniture such as wardrobes. What’s your point of dew? The Solution A straight forward re-render or repair will solve the first issue of the compromised external wall, the second source of moisture is quite different. This type of damp is in the form of condensation. It's actually caused by the difference in temperature from the air in the room (warm air) to the temperature of the wall (cold wall). Warm air is capable of suspending more moisture than cold air, so when the warm air and cold wall meet, the air cools leaving a small deposit of water behind, this is known as the dew point. The solution to this problem is to ensure the internal wall remains suitably warm, therefore removing the dew point. So by installing external wall insulation on the exterior of the property and then finish (for example with a render), you indirectly and directly solve both potential problems. This means damp and condensation are completely eradicated, which in turn promotes a healthier living environment for the house occupants. No damp, no mould, good health! EWI Feels cosy and looks great! Literally any finish can be achieved over an external wall insulation solution. A stunning coloured render is a popular option, many opt for a cladding finish or an elegant wall coating, the options are endless! My walls have no cavity, what now? Properties with solid walls, single skin walls or prefab houses, have no cavity in their walls, therefore cavity wall insulation is not an option. Older properties with cavity walls, tend not to get particularly good results from cavity wall insulations and have been known to cause internal damp. For both of these reasons, external wall insulation is an ideal option. Although more costly, as each EWI installation is tailor made, it’s possible to far exceed the thermal insulation of alternatives such as cavity wall insulation. As mentioned previously, it’s even possible to convert properties into super insulated buildings. Firstly, there are efficiency savings by encorprating this job into the existing work. Any scaffolding used, finishes applied and numerous time savings advantages, mean the price of including EWI as part of planned work will be much lower than simply installing EWI from the beginning. The second, quite significant advantage, is the huge saving on VAT. Have exterior wall insulation installed by Avant Coatings Ltd and we pay the VAT... on the whole project! This means, a project involving the stripping of old render material, installing external insulation and finishing with a coloured render, acrylic render, silicon render, monochouche render, a brick or stone cladding, pebbledash or stucco finish is all VAT FREE! THERMAL RESISTANCE. (R VALUE) – a measurement of an individual building components ability to resist the passage of heat. The higher the thermal resistance the better insulant is present. The R-value is the reciprocal of the U-value. THERMAL MASS - is the ability of a building to store thermal energy, it is equivalent to thermal capacitance or heat capacity. DPC – Damp proof course. This should not be bridged or crossed as it can lead to rising damp.